Taste test: These really do taste like curry. They curry's pretty strong, with a spicy aftertaste. Quite good. The curry flavoring is so powerful that you really don't taste the potato at all. 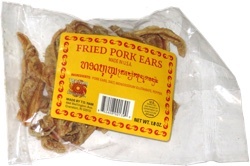 Smell test: Smells like a curry dish from your favorite Thai restaurant. 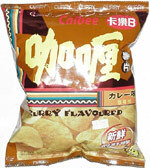 From the package: It says “curry” on the bag at least 27 times.